Here in Älvdalen there are many fine beaches of varying character. 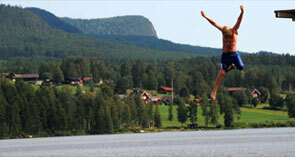 Grundsand in Lake Nässjön is a family-friendly one with diving tower and barbecue facility. In the River Österdalälven at Åsen there are curiously black rocks and the water usually gets quite warm during the summer. In the River Österdalälven at Väsa, Västäng and Gåsvarv the beaches are somewhat more secluded and also these, family-friendly and with barbecue facilities. At the tarn Loka Tjärn is a beach where dogs are welcome. A canoe tour on the River Österdalälven is an exciting adventure. An easy job with the aid of the current and gliding downstream gives a pleasant tingling sensation. Despite the current, there is no need to be afraid about handling the canoe. To the north of Älvdalen the water is flowing faster but south of Älvdalen, quite still. Transportation to the starting point of your choice is available. Along the tour there is scenic nature and plenty of fine sites to go ashore for a pleasant break. With a strong population of beavers, chances are good of spotting one or more. Fulufjället is Sweden’s southernmost fells national park. The major attraction is Njupeskär, the tallest waterfall in the country with its 93 metres. The national park tempts with dramatic scenery and excellent habitats for dippers, grey wagtails and the largest falcon in the world, the gerfalcon. A walk to Njupeskär will take you across bogs, through magic ancient spruce forests and light arctic birch-tree forests. On Mount Fulufjället lives the oldest tree in the world and there are also traces of the most dramatic rainstorm in one thousand years. Those who wish to explore the national park thoroughly will find as much as 140 km of marked hiking trails, six cabins for overnight stays and ten resting shelters. 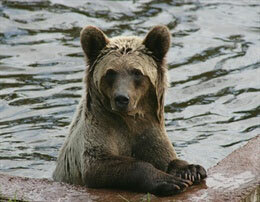 The various organisers may guide you to the best fishing waters or on elk or beaver safaris as well as bird-watching. In the winter you can go dog-sledding or snowmobiling, try kite-surfing or snowshoe walking. Expert climbers can have a go at Njupeskär’s ice sheet. Before setting off to explore the national park, a visit to Naturum Fulufjället is well-invested time. Here are exhibitions and information on the flora and fauna. This is also the starting point for the guided tours with knowledgeable staff in place. A visit to the nature reserve Hykieberg is a pleasant way to spend a day for young and adults alike. 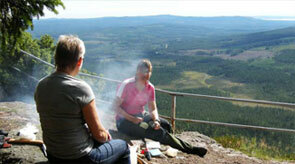 Here is a steep 100 metres tall precipice and Hykieberg is also a ’must’ for climbing aficionados. At the very summit of the peak is a barbecue shelter ‘slogbod’, situated about 20 minutes’ walk from the parking area. Underneath the face of rock you will find various species of flora which would not normally grow this far north. A visit to Gessi Fäbod is a journey back in time. The shieling or summer farm has many animals: cows, goats, hens, rabbits, reindeer, horses and more who come here for summer pasture. You can also buy produce from the shieling and on Saturdays the café is open. You can travel here by horse-driven cart and even stay overnight and experience the shieling life and feast. Approximately 45 minutes by car from Älvdalen is Orsa Björnpark, the largest in its kind in Europe. Here you can see the predators in their natural setting. In addition to the Scandinavian brown bears, here are also Kamchatka brown bears, wolves, lynxes, foxes, wolverines, eagle owls, and Siberian tigers. In the summer 2009, the world’s largest polar bear facility Polar World opened in Orsa Björnpark and during the summer 2010 the fauna will be complemented by Snow Leopards. The park also comprises Rovdjurscentrum/Designtorg trä, a building with all sorts of information on predators. A drive is a good way of exploring Älvdalen. The tour can start on the Scenic Route, between Brunnsberg and Åsen, with village environments and fine views. Then continue to Trängslet with spectacular views and the largest earth dam. Proceed to Navardalen, a hostel and café in the wilderness with grizzly-strong coffee. 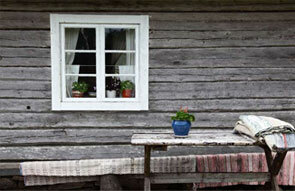 On the way back, make a stop at Rot Skans, an old fortification and now homestead museum.